1977-CZ-DST is rated 5.0 out of 5 by 22. 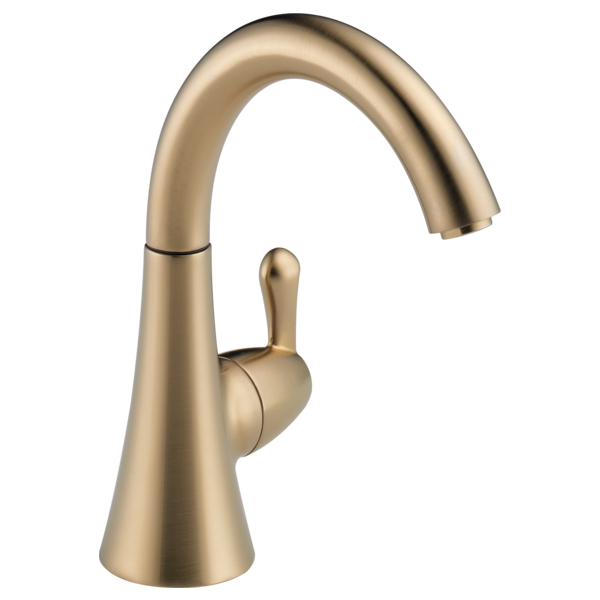 Rated 5 out of 5 by kitchenrenofatigue from Solid Performer I bought this faucet to replace the plastic one that came with my reverse osmosis (R/O) system. 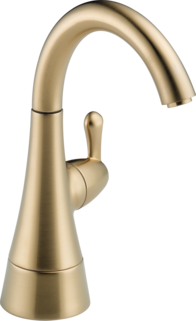 This Delta faucet has a solid feel and is easy to keep clean. Installation was quick and easy once I snipped off the factory supplied connector from the end of the tubing supply to modify the connection to my R/O system. Rated 5 out of 5 by Raymond from Great product. Very stylish product. Look good alone side new Delta faucet. Rated 5 out of 5 by Barney 5 from Works Great I've installed many RO faucets and had problems with the ones with the simple flip mechanisms. This one has a handle that works like a regular faucet which works much better and doesn't leak, or drip. Rated 5 out of 5 by CajunNewsGirl from Beautiful RO faucet I bought this faucet about 6 months ago and it still looks as shiny as the day I bought it. I hated that old RO faucet that came with the unit, so when we remodled our litchen we replaced it with this Delta and it made such a difference. It also works much better than the old one, no dripping and easy to clean. Rated 5 out of 5 by Caroline from Love the finish I bought this a couple of months ago as part of a kitchen update in our new house. It is a great product. The faucet is easy to use and delivers lovely fresh water with the flick of a lever. The finish won me over straight away and it's even better in real life! I am addicted to the colour and bought matching kitchen faucet and then moved on to similar in our half bath. What water filtration system can or should be used for this faucet? I have a customer that has an insinkerator HOT100...will this work with that? Simply put &quot;does this faucet meet NSF Standard 58&quot;, Kinetico will not warranty their system unless it does. 1977-cz-dst Can I install with both hot and cold water? I was told the red line was for the hot water, if so, can this faucet run both hot and cold? Does this faucet meet NSF Standard 58 for use with reverse osmosis? Which finish (stainless or artic stainless) would best match Moen's &quot;spot resist stainless&quot; finish? I know this is a weird question, but I am hoping you have some kind of chart comparing finishes between yours and other manufacturers finishes. This faucet (1977 AR DST) is absolutely the best choice out of all I have looked at (and I have looked!!) to replace and old filtered water faucet I currently have. It will be sitting in close proximity to a full size faucet purchased from Moen. That finish is called &quot;Spot Resist&quot; stainless. It is described by them as &quot;stainless with a lightly brushed warm metallic surface&quot;. I am hoping you can tell me which of your surface finishes will best match. I think the best choice is betweeen your standard stainless #which looks a little brushed on my screen but I can't really tell# and your artic stainless. Please advise me as to what you believe would be the best to match. Thank you for any input you can give. Thank you for your question. We do not have a color match to our competitor's finish but we can describe the difference between the two finishes. The Stainless Steel finish does have more of a brushed look than the Artic Stainless. The Artic Stainless has more of blue tint and the Stainless Steel has a gold tint to it. Can this faucet be used for both hot and cold filtered water? There are e lines coming from the 1977-DST R.O. faucet: 1/4&quot; red, 3/8&quot; black, 3/8&quot; grey. The installations diagram has the red and black lines clearly noted, but the main line is only noted as, &quot;Line to RO filter Outlet&quot;. Is that the grey one? Can you reverse this faucet to have the handle on the left? If so will you be able to switch the direction of travel so it still rotates forward.